When the chips were down, Fife Flyers delivered. A team staring down the barrel of a five-game losing streak, and sliding towards the play-off trap door, produced a big result on a night when there was no alternative. They had to dig deep for this overtime win over a Glasgow Clan side that has been on the best run of form in the EIHL. They had to overcome adversity, twice falling behind in the first period as well as boiling over with frustration at some of the refereeing decisions. It only served to galvanise the players, culminating in a short-handed overtime winner from Carlo Finucci that raised the roof. It wasn't quite Kyle Haines in 2016, but the atmosphere after this goal was as good as anything since, and the sight of players dancing along to the chants of the home crowd as they gathered for the post-match presentations felt like a turning point in the season. Time will tell if that proves the case, but there was a different energy about Flyers compared to some of the more laboured performances of late. They chased down every loose puck, fought their corner, and barring one horrible mistake which cost them a goal, they defended resolutely. As Todd Dutiaume pointed out afterwards: "This felt like a Fife-Glasgow play-off weekend. "We were okay last night, but tonight we were way better. "I loved our commitment and compete level. We held them goalless on the PP all weekend - a testament to our kill." Dutiaume refused to discuss his frustrations over the refereeing performance, adding: "I’m not commenting on officials. "The crowd were watching the game, they know what happened. "It would have been a shame - both ways - if that game was decided on the 5 on 3s, or OT powerplay, because both teams played good." Marcus Basara was the healthy import scratch as Flyers iced a full line-up. The opening exchanges were end-to-end but it was Clan who drew first blood on 8.40 as an unsighted Shane Owen spilled a shot into his crease, and Craig Peacock reacted sharpest to prod it home. After defeat in Glasgow the previous night, Flyers fans may have been fearing the worst, but a needless 12th minute penalty taken by Scott Pitt handed the hosts a powerplay which they turned into an equaliser within seconds. It was a trademark Evan Bloodoff effort as he hustled his way into a scoring position at the net and buried the chance. The goal gave Flyers a burst of energy that saw them swarm the Clan net, but their momentum was sapped on the 16 minute mark when a careless pass from behind his own net from Ricards Birzins went straight to Tyson Wilson, and the Clan D-man set up Rasmus Bjerrum for an easy tap-in. Previous losses have been blamed on one mistake affecting the team's psyche, but Flyers displayed mental toughness to fight back for a second time, again via Bloodoff on the powerplay, as he collected a Mike Cazzola shot from the backboards and squeezed it past Joel Rumpel. The second period was tightly contested with few grade A scoring opportunities, but Fife were presented with back-to-back powerplays early in the third which they failed to take advantage of, with too much time wasted outside the Clan zone. As the match entered the closing stages, Fife were penalised twice in a matter of seconds, with both Danick Gauthier and James Isaacs sent to the penalty box, the latter absolutely furious with the decision to call him for interference as he slid into the net with a Clan skater. But the five-on-three barely lasted 30 seconds when Clan were then penalised not once, but twice, as the officiating took centre stage. The teams were eventually even-strength for the final three minutes until Rick Pinkston chipped the puck over the glass to sit for delay of the game. Flyers penalty kill - imperious all weekend in holding Clan to 0/11 - produced another top drawer effort to see the game to overtime, only for the referees to intervene again, calling a cheap tripping penalty on Scott Aarseen to leave Flyers to defend a four-on-three. 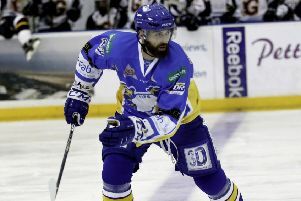 Step forward Carlo Finucci - a man who has scored his fair share of big goals for Fife. Having been involved in a fight the previous night, the forward played with an edge all night, culminating in a simply superb solo effort as he gritted his teeth, leaving Clan skaters in his wake as he drove the net, and applied the backhand finish to seal the extra point. The choice for Fife is now whether to bring this level of commitment every night and push for a third place finish, or fall back into their bad habits and face a fight to hold onto a top eight place.